Berlin Studios is a fully equipped studio that offers superb recording facilities in a professional environment. We are ideal for artists who want to record a demo, single or album and expect the very best results.  Whatever your recording requirements, Berlin Studios has the equipment and expertise for a successful recording project. Our recording engineer will work with you to bring out your full potential. With a spacious live room, isolated drum / vocal booth and air-conditioned control room, the studio has every aspect to make any recording a success. The live room design is built to hold a sizeable group of musicians, which means the ability to record multiple players in real time or as a single performance. We are very mindful of the fact that many musicians can and like to record at home. For this reason we've concentrated on aspects you cannot achieve with home recordings. We have the highest quality throughout the signal chain (from microphones to pre-amps to valve mixing to top quality AD-DA convertors and amazing outboard gear and plug-ins). We also have professional engineers whose ears have been trained to hear the issues that you are unlikely to notice without the same years of experience. The studio prides itself on producing the highest quality output by using industry-recognised equipment coupled with our years of experience.